Nando’s is the latest addition to the extensive Manor Walks Shopping & Leisure complex in Cramlington, which sits in the south east corner of Northumberland, easily accessible from the A1 and close to visitor attractions such as Northumberlandia and Seaton Delaval Hall. 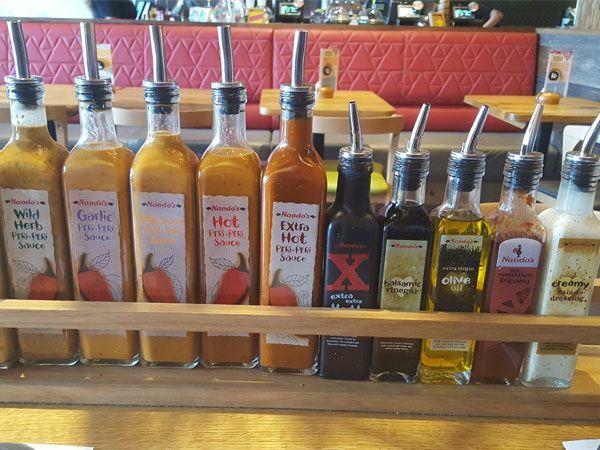 Bringing a taste of PERi-PERi to Northumberland, this popular restaurant chain has transformed their unit into a jovial and inviting place to eat. From the authentic artwork adorning the walls, to the handcarved stools in the waiting area, the ambience is decidedly warm and friendly. Their menu includes old favourites alongside tasty new options, including delicious chicken with a choice of heat from Lemon and Herb up to Extra Hot, an expanding selection of side dishes, including macho peas and a new favourite, the Supergrain Salad, plus a selection of desserts which continue the Portuguese theme. Even better than the free parking on-site, is the fact they do take-away, ideal for those visitors staying in a self-catering cottage nearby who want to enjoy food in their accommodation without the hassle of cooking it themselves. The addition of Nando’s to Manor Walks really rounds off what is an all-round shopping and leisure destination, ideal for rainy days or a spot of retail therapy. With the Vue cinema and Concordia Leisure Centre all on site, it gives visitors plenty of options for a full day out in south east Northumberland.